From Egypt to the present day, the cancer has been part of the history of mankind. These images show how it has been fighting this disease. It is called cancer and is one of our worst enemies. It comes suddenly, like the friend who called to be dropped at home. An x-ray with a strange spot, an analytical unexpected values. The time between doubt and certainty, enough for the mask is removed. And say, "here I am, I have come to stay." Since when we know that there is cancer? Some say that this disease is as old as mankind. Reason does not lack. The first clinical cases were found in the papyrus of Edwin Smith, a historical document in 1,600 BC collected some details about this disease. Belonging to the era of the dynasty XVII, it was found and acquired by the merchant Edwin Smith in 1862. He is currently exposed at the Academy of Medicine in New York, although not the only Egyptian relic in which the cancer is described. 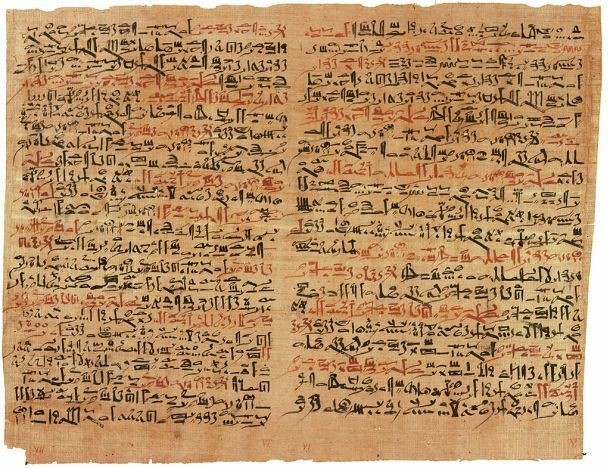 Also the papyrus George Ebers, considered one of the oldest medical treatises, collects some details on possible cases of breast cancer and uterine cancer. If there is a key figure in the history of medicine , it is certainly Hippocrates . Greek was the first to use the term 'karkinos' (καρκίνος) to refer to 'canker' or 'cancer'. It is curious, as this concept also derives the word 'crab'. Some historians attribute this similarity between crab and cancer to "tumors are as hard as a shell." Cancer is also a tenacious disease, which manages change of location in the body. Even some cases of breast cancer are similar to the legs of a crab -like appearance. Greek mythology also includes the concept of crab. In the struggle of Heracles against Hidra of Lerna, the hero gets escape the crab sent by Hera to bite her feet and hinder him in the fight. He failed to kill him, but he survived the attack 'karkinos'. Today we see this battle in a lekythos preserved in the Louvre in Paris. On World Cancer Day is much talk about advances in treatments and therapies against the disease. But the fact is that this fight extends back in time to the Middle Ages itself. As an example we can point to Clara Jacobi, a woman who suffered a massive brain tumor. 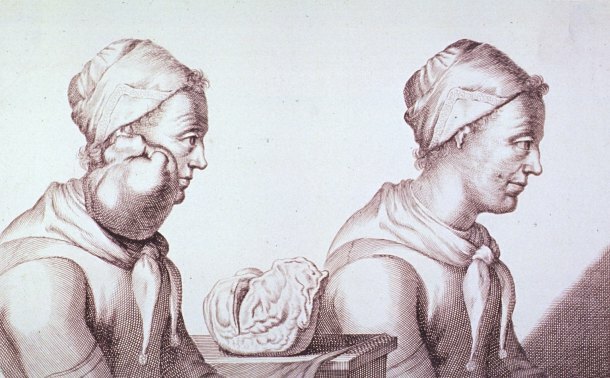 In the 1689, and with rudimentary techniques of the time, they managed to surgically remove the mass that had grown on the neck of this Dutch. How to operate a tumor? It would have to pass a century until they understand how the surgical removal of a tumor could be done. For Jacobi, it was easier to extract the visible mass. But what would happen if the tumors were located in the body? The scientific basis the first determined Giovanni Battista Morgagni, an Italian doctor who forever changed pathology. He began performing autopsies in a more careful manner, improving the diagnosis of many diseases. After the work of Morgagni, the Scottish surgeon John Hunter suggested that cancer could be "removed" from the body. As happened with Jacobi, Hunter argued that the tumor masses that were developed within the body also had to be removed. His book can be consulted today online through the archive of the National Institutes of Health (NIH) in the United States. Why cancer occurs? This question is often raised by patients and families. Until the nineteenth century, medicine had striven to know where tumor masses appeared and how to eliminate them from the body. But it was Rudolf Virchow who first understood the root of the cancer was in our own cells. 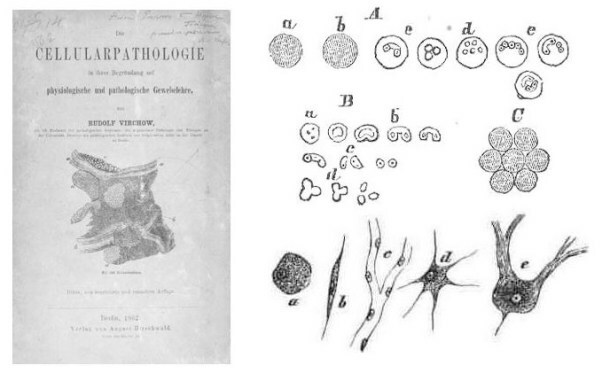 In 1858, he wrote in Diecellulare Pathologie that the basis of any disease should be studied and understood at the cellular level. Also cancer. Today his work remains fundamental: much of the research focuses on understanding how errors occur in our cells for a tumor originates. In 1942, scientists at Yale University decided to investigate why. They found that mustard gas was an alkylating able to modify the DNA in our cells. Composed Subsequent studies led to the development of chemotherapeutic drugs such as chlorambucil, melphalan or busulfan, widely used in treating leukemias, lymphoma or myeloma. He was born chemotherapy. Gordon Isaacs was only seven months old when his mother took him to the pediatrician. The medical examination did not raise suspicions, but Helen felt that something was wrong. He felt there was something strange in the eyes of his son. His suspicions were true. In 1955, an ophthalmologist discovered that the child suffered double retinoblastoma in both eyes, a type of childhood tumor malignant cells affecting retinal tissues. CancerExisting treatments were wholly threatening. They could choose to surgically remove the tumor, which would hurt forever baby's sight. Maybe they should try cobalt radiation. None of the solutions seemed to remedy the problem suffered by the small Gordon. Then came the visionary Henry Kaplan , a pioneer physician in the field of radiobiology. Kaplan decided to use linear accelerators that could attack tumors Gordon, minimizing tissue damage unaffected. There was only one problem: they had never been used in a real patient. Less than a baby. Helen decided to accept the proposal of the doctor, who lead the hospital for six weeks, in which the child would have to be anesthetized daily to receive a dose. So it was the birth of radiotherapy , which would then be applied successfully by Kaplan in the treatment of Hodgkin lymphoma. Happened in 1970. President Richard Nixon announced the ban on snuff advertisements on radio and television. The measure was -tardía- response to a report six years earlier by Luther Terry in a historic press conference. At the conference the results of the document Report on Smoking and Health were clear: the snuff produced cancer. The first suspicions about the snuff soared in 1939. Some scientists began to warn that snuff could be a potent carcinogen, but the tobacco industry pressures were too strong. Today we know that smoking is responsible for 90% of cases of lung cancer. For some, unfortunately, this statistic comes too late. The same year in which died of cancer Alfred S. Bloomingdale, inventor of credit cards, the US government informed the residents of Times Beach (Missouri) that their city was contaminated by some environmental toxicants. As a result, the town had to be evacuated and demolished urgently. Times Beach thus became a symbol of environmental effects on our health. The culprits were toxic dioxins, which had been dumped on unpaved roads in the area. Today the World Health Organization recognizes the high toxicity of these chemicals, which depopulated region of the United States. 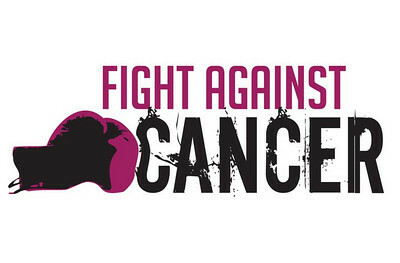 The fight against cancer has not been without difficulties. Perhaps who best represents these obstacles is Terry Fox , Canadian athlete who led the marathon for hope. At the young age of 19, Fox was diagnosed with osteosarcoma, a malignant tumor that affected his knee. Doctors could not do more to amputate the leg, then apply a treatment based chemotherapy. Terry Fox managed to raise public awareness of the importance of research. Terry Fox knew that the administration of chemotherapeutic allowed to have a 50% chance over beat cancer. But that was not the most surprising percentage. Only two years earlier, his chances were reduced to 15%. That's where the athlete understood the importance of cancer research. With the aim of raising funds for science, in 1980 he started across Canada from end to end. In total 5,373 kilometers he traveled in 143 days. His marathon for hope at the time raised 1.7 million dollars. Fox had won, showing how important it was to fund research of this disease. Unfortunately, he could not win his personal battle. In 1981, he died from complications of cancer. 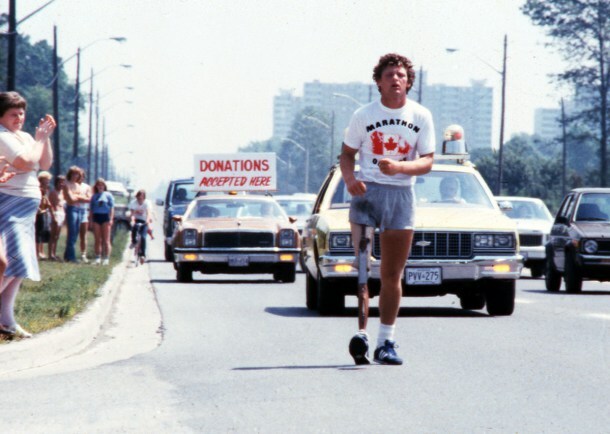 Terry Fox became a true symbol and an example of hope for millions of patients worldwide.